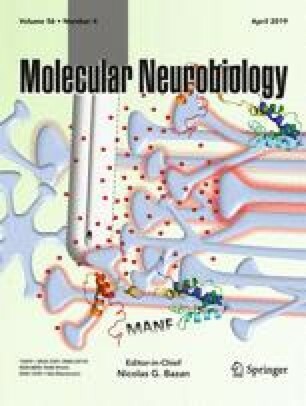 The current study was performed to establish the actions of nanomolar concentrations of cocaine, not blocking the dopamine transporter, on dopamine D2 receptor (D2R)-sigma 1 receptor (δ1R) heteroreceptor complexes and the D2R protomer recognition, signaling and internalization in cellular models. We report the existence of D2R-δ1R heteroreceptor complexes in subcortical limbic areas as well as the dorsal striatum, with different distribution patterns using the in situ proximity ligation assay. Also, through BRET, these heteromers were demonstrated in HEK293 cells. Furthermore, saturation binding assay demonstrated that in membrane preparations of HEK293 cells coexpressing D2R and δ1R, cocaine (1 nM) significantly increased the D2R Bmax values over cells singly expressing D2R. CREB reporter luc-gene assay indicated that coexpressed δ1R significantly reduced the potency of the D2R-like agonist quinpirole to inhibit via D2R activation the forskolin induced increase of the CREB signal. In contrast, the addition of 100 nM cocaine was found to markedly increase the quinpirole potency to inhibit the forskolin-induced increase of the CREB signal in the D2R-δ1R cells. These events were associated with a marked reduction of cocaine-induced internalization of D2R protomers in D2R-δ1R heteromer-containing cells vs D2R singly expressing cells as studied by means of confocal analysis of D2R-δ1R trafficking and internalization. Overall, the formation of D2R-δ1R heteromers enhanced the ability of cocaine to increase the D2R protomer function associated with a marked reduction of its internalization. The existence of D2R-δ1R heteromers opens up a new understanding of the acute actions of cocaine. Dasiel O. Borroto-Escuela and Manuel Narváez these authors have contributed equally to this work. It recently became clear that cocaine in the nanomolar range can enhance dopamine D2 receptor (D2R) functions without blocking the dopamine uptake mechanism as found in neurochemical and behavioral work [1, 2]. These results indicated that cocaine can exert a direct or indirect positive allosteric modulation of the striatal D2R in line with the demonstration of a cocaine-induced enhancement of Gi/o coupling at striatal D2R . Such actions are likely of relevance for the rewarding and relapse-induced effects of cocaine in view of the major role of accumbal D2R in mediating these actions of cocaine [3, 4]. The inhibitory D2R are enriched in the dorsal and ventral striato-pallidal GABA neurons, the ventral component of which is an anti-reward system  which becomes inhibited by D2R activation . It is known that sigma 1 receptors (δ1R) exist in substantial densities in large numbers of central neurons including accumbal neurons [7, 8]. Cocaine was found to interact with δ1R and δ1R antagonists diminished cocaine actions [9, 10, 11]. Instead, reinforcing effects of cocaine self-administration were observed with δ1R agonists . The molecular mechanism of cocaine actions in the brain can probably involve δ1R-D1R and δ1R-D2R heteromerization [13, 14, 15]. 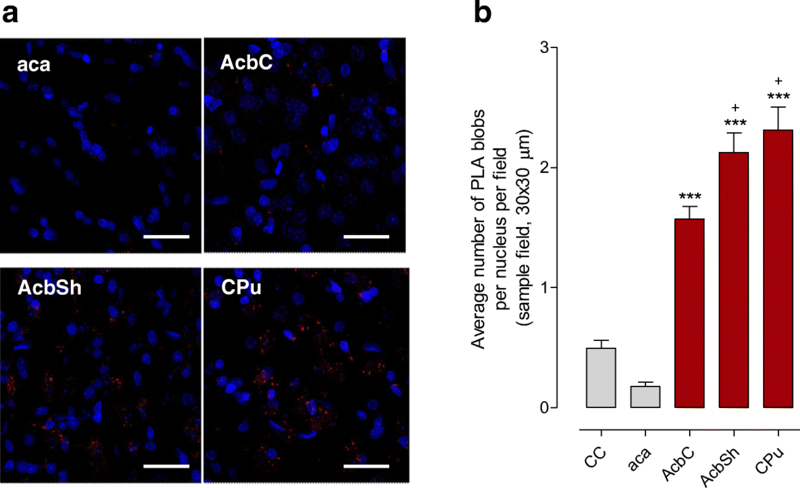 Using BRET, δ1R-D1R heteroreceptor complexes were demonstrated in cotransfected cells . The evidence suggested a direct involvement of δ1R in mediating the cocaine-induced (150 μM) enhancement of D1R signaling over the Gs-AC-PKA signaling pathway. δ1R-D2R heteroreceptor complexes were also demonstrated both in cotransfected cells and in striatum . In cotransfected cells, cocaine in the micromolar range (30 μM) was able to partially counteract the activation by the D2R agonist quinpirole of the Gi/o-mediated signaling of the D2R. This inhibitory action of cocaine on D2R-mediated Gi/o signaling was mediated via the δ1R protomer . These results were in sharp contrast to results obtained with 100 nM of cocaine which demonstrated that cocaine enhanced the quinpirole-induced D2R signaling as studied on accumbal extracellular dopamine levels and on the efficacy of dopamine to stimulate binding of GTPγS to striatal D2-like receptors . Furthermore, the locomotor actions of quinpirole were enhanced by sub-threshold doses of cocaine. Recently, indications were obtained that D2R-δ1R complexes exist on striatal dopamine and glutamate nerve terminals. Nanomolar concentrations of cocaine were found to enhance the Gi/o-mediated D2R signaling in such complexes . The possible existence of D2R-δ1R-N-type calcium channel heteroreceptor complexes was proposed . The current study was performed to establish the actions of nanomolar concentrations of cocaine, not blocking the dopamine transporter, on δ1R-D2LR and δ1R-D2SR heteroreceptor complexes and the D2R protomer recognition, signaling, and internalization in cellular models. Furthermore, the distribution of the δ1R-D2R complexes in the ventral and dorsal striatum was evaluated using the in situ proximity ligation assay. All experiments were performed using male Sprague-Dawley rats (SD) (Scanbur, Sweden). The animals were group-housed under standard laboratory conditions (20–22 °C, 50–60% humidity). Food and water available ad libitum. All studies involving animals were performed in accordance with the Stockholm North Committee on Ethics of Animal Experimentation, the Swedish National Board for Laboratory Animal and European Communities Council Directive (2010/63/EU) guidelines for accommodation and care of Laboratory Animals. The constructs presented herein were made using standard molecular biology as described previously [17, 18, 19]. HEK293T cells were grown and transiently transfected as depicted in Borroto-Escuela et al. .
First, animals were deeply anesthetized by an intraperitoneal (i.p.) injection of a high dose of pentobarbital (60 mg/ml, [0.1 ml/100 g]) and then perfused intracardially with 30–50 mL ice-cold 4% paraformaldehyde (PFA) in 0.1 M phosphate-buffered saline (PBS, pH 7.4) solution. After perfusion, brains were collected and transferred into well-labeled glass vials filled with 4% PFA fixative solution for 6–12 h. Then, the brains were placed in 10% and 30% sucrose (0.1 M PBS, pH 7.4) and incubated for 1 day (10% sucrose) and a number of days (30% sucrose) at 4 °C with several sucrose buffer changes, until freezing the brain. The brains were frozen with isopentane and then sectioned (10–30 μm-thick) using a cryostat. The brain’s slices were stored at − 20 °C on Hoffman solution. To study the formation of the D2R-δ1R heteroreceptor complexes, the in situ proximity ligation assay (in situ PLA) was performed as described previously [20, 21, 22, 23]. Free-floating formalin-fixed brain sections (30 μm) at Bregma level (1.0 mm) from untreated Sprague–Dawley rats were employed using the following primary antibodies: mouse monoclonal anti-D2R (MABN53, 1:600, Millipore, Sweden) and rabbit monoclonal anti-sigma1R (ab53852, 1:500, Abcam, Sweden). Control experiments employed only one primary antibody. The PLA signal was visualized and quantified by using a confocal microscope Leica TCS-SL confocal microscope (Leica, USA) and the Duolink Image Tool software. Briefly, fixed free-floating rat brain sections (storage at − 20 °C in Hoffman solution) were washed four times with PBS and quenched with 10 mM glycine buffer (0.75 g glycine in 100 ml PBS), for 20 min at room temperature. Glycine buffer is used to reduce unspecific antibodies binding and brain tissue autofluorescence. Then, after three PBS washes, incubation took place with a permeabilization buffer (10% fetal bovine serum (FBS) and 0.5% Triton X-100 or Tween 20 in Tris buffer saline (TBS), pH 7.4) for 30 min at room temperature. Again, the sections were washed twice, 5 min each, with PBS at room temperature and incubated with the blocking buffer (0.2% BSA in PBS) for 30 min at room temperature. The brain sections were then incubated with the primary antibodies diluted in a suitable concentration in the blocking solution for 1–2 h at 37 °C or at 4 °C overnight. The day after, the sections were washed twice, and the proximity probe mixture was applied to the sample and incubated for 1 h at 37 °C in a humidity chamber. The unbound proximity probes were removed by washing the slides twice, 5 min each time, with blocking solution at room temperature under gentle agitation, and the sections were incubated with the hybridization-ligation solution (BSA (250 g/ml), T4 DNA ligase (final concentration of 0.05 U/μl), Tween-20 (0.05%), NaCl 250 mM, ATP 1 mM, and the circularization or connector oligonucleotides (125–250 nM)) and incubated in a humidity chamber at 37 °C for 30 min. The excess of connector oligonucleotides was removed by washing twice, for 5 min each, with the washing buffer A (Sigma-Aldrich) Duolink Buffer A (8.8 g NaCl, 1.2 g Tris Base, 0.5 ml Tween 20 dissolved in 800 ml high purity water, pH to 7.4) at room temperature under gentle agitation, and the rolling circle amplification mixture was added to the slices and incubated in a humidity chamber for 100 min at 37 °C. Then, the sections were incubated with the detection solution in a humidity chamber at 37 °C for 30 min. In a last step, the sections were washed twice in the dark, for 10 min each, with the washing buffer B (Sigma-Aldrich, Duolink Buffer B (5.84 g NaCl, 4.24 g Tris Base, 26.0 g Tris-HCl. Dissolved in 500 ml high purity water, pH 7.5) at room temperature under gentle agitation. The free-floating sections were put on a microscope slide and a drop of appropriate mounting medium (e.g., VectaShield or Dako) was applied. The cover slip was placed on the section and sealed with nail polish. The sections were protected against light and stored for several days at − 20 °C before confocal microscope analysis. The BRET2 saturation experiment was performed as described previously, see [17, 24]. Forty-eight hours after transfection, HEK293T cells, transiently transfected with constant (1 μg) or increasing amounts (0.12–5 μg) of plasmids encoding for D2RRluc and δ1RGFP2, respectively, were rapidly washed twice in PBS, detached, and resuspended in the same buffer. Cell suspensions (20 μg protein) were put in duplicates into the 96-well microplate black plates with a transparent bottom (Corning 3651) (Corning, Stockholm, Sweden) for fluorescence measurement or white plates with a white bottom (Corning 3600) for BRET determination. For BRET2 measurements, coelenterazine-400a also called DeepBlue™C substrate (VWR, Sweden) was used at a final concentration of 5 μM. The readings were made 1 min after using the POLARstar Optima plate-reader (BMG Labtechnologies, Offenburg, Germany) that allows the sequential integration of the signals observed with two filter settings [410 nm (80 nm bandwidth) and 515 nm (30 nm bandwidth)]. The BRET2 ratio is defined as previously described by Borroto-Escuela et al. . Briefly, data are represented as a normalized BRET2 ratio, which is defined as the BRET ratio for coexpressed Rluc and GFP2 constructs normalized against the BRET ratio found for the Rluc expression construct alone in the same experiment: BRET2 ratio = [(GFP2 emission at 515 ± 30 nm)/(Rluc emission 410 ± 80 nm)] – cf. The correction factor, cf., corresponds to (emission at 515 ± 30 nm)/(emission at 410 ± 80 nm) found with the Receptor-Rluc construct expressed alone in the same experiment. Forty-eight hours after transfection, HEK293T cells transiently transfected with constant amounts (1 μg) of plasmids encoding for D2LRRluc and δ1RGFP2 and increasing amounts (0.1–8 μg) of plasmids encoding for wild-type D2LR, D2SR or δ1R and the mock pcDNA3.1+, respectively. The energy transfer was determined as described for the BRET2 saturation assay. Competition experiments of quinpirole (0.3 nM-3 mM) versus the D2-likeR antagonist [3H]-raclopride (2 nM; specific activity 78.1 Ci/mmol, PerkinElmer Life Sciences, Stockholm, Sweden) were carried out by membrane (20 μg per well) incubation at 30 °C for 90 min. Non-specific binding was defined by radioligand binding in the presence of 10 μM (+)-butaclamol (Sigma-Aldrich, Stockholm, Sweden). The incubation was terminated by rapid filtration through hydrophilic (LPB) Durapore ®Membrane (Millipore, Stockholm, Sweden) using a MultiScreen™ Vacuum Manifold 96-well (Millipore Corp, Bedford, MA), followed by five washes (200 μl per wash) with ice-cold washing buffer (50 mM Tris–HCl pH 7.4). The filters were dried, 4 ml of scintillation cocktail was added, and the bound ligand was determined after 12 h by liquid scintillation spectrometry. Saturation binding experiments with the D2-likeR antagonist [3H]-raclopride (specific activity 82.8 Ci/mmol, PerkinElmer Life Sciences, Sweden) were performed in membrane preparations from single and cotransfected HEK cells (100 μg protein/ml) incubated with increasing concentrations of [3H]-raclopride (ranging from 0.1 nM to 12 nM) in 250 μl of incubation buffer (50 mM Tris–HCl, 100 mM NaCl, 7 mM MgCl2, 1 mM EDTA, 0.05% BSA and 1 mM dithiothreitol) for 60 min at 30 °C in the presence or absence of cocaine (1 nM, 10 nM, and 100 nM) and the high affinity sigma 1 receptor antagonist PD144418 . Non-specific binding was defined by radioligand binding in the presence of 10 μM (+) butaclamol (Sigma Aldrich, Sweden). The incubation was terminated by rapid filtration Whatman GF/B filters (Millipore Corp, Sweden) using a MultiScreen™ Vacuum Manifold 96-well followed by three washes (~ 250 μl per wash) with ice-cold washing buffer (50 mM Tris–HCl pH 7.4). The filters were dried, 5 ml of scintillation cocktail was added, and the bound ligand was determined after 12 h by liquid scintillation spectrometry. A dual luciferase reporter assay has been used to indirectly detect variations of cAMP levels in transiently transfected cell lines treated with different compounds in a range of concentrations (typically 0.1 nM to 1 μM). For luciferase assays, 24 h before transfection, cells were seeded at a density of 1 × 106 cells/well in 6-well dishes and transfected with Fugene (Promega, Stockholm, Sweden). Cells were co-transfected with plasmids corresponding to the four constructs as follows (per 6-well): 2 μg firefly luciferase-encoding experimental plasmid (pGL4-CRE-luc2p; Promega, Stockholm, Sweden), 1 μg of D2R plus σ1R expression vectors, and 0.5 μg Rluc-encoding internal control plasmid (phRG-B; Promega). Approximately, 46 h post-transfection, cells were incubated with appropriate ligands and harvested with passive lysis buffer (Promega, Stockholm, Sweden). The luciferase activity of cell extracts was determined using the Dual-Luciferase® Reporter (DLR™) Assay System according to the manufacturer’s protocol Promega, Stockholm, Sweden) in a POLAR star Optima plate reader (BMG Labtechnologies, Offenburg, Germany) using a 535-nm filter with a 30-nm bandwidth. Firefly luciferase was measured as firefly luciferase luminescence over a 15-s reaction period. The luciferase values were normalized against Rluc luminescence values (Luc/Rluc ratio). Chemicals used for the gene reporter assays (Raclopride, quinpirole, forskolin) were purchased from Tocris (UK) and (cocaine-HCL) Sigma Aldrich (Germany). Internalization of D2R were evaluated by fluorescence confocal microscopy using transiently single or cotransfected HEK293T cells with constant (1 μg) amounts of plasmids encoding for Sigma1R and D2LRYFP. Cells were incubated with cocaine (100 nM) at different interval times or with a range of cocaine concentrations (1 nM–10 μM) during 30 min. Then, cells were fixed in 4% paraformaldehyde for 10 min, washed with PBS containing 20 mM glycine, and mounted in a Vectashield immunofluorescence medium (Vector Laboratories, UK). Microscope observations were performed with a × 63 oil immersion objective in a Leica TCS-SL confocal microscope (Leica, USA). The amounts of internalized D2RYFP are shown as a single z-scan image. The rate of internalization was measured as the ratios (IntROI/membROI). The memROI is obtained by measuring the D2RYFP fluorescence area detected at the cell surface membrane depicted by phase contrast). The IntROI is instead obtained by measuring the entire D2RYFP fluorescence area detected in the cytoplasm of the entire cell. The basal value is obtained from cells not exposed to cocaine. The number of samples (n) in each experimental condition is indicated in figure legends. Data from competition experiments were analyzed by nonlinear regression analysis using GraphPad Prism 5.0 (GraphPad Software Inc., San Diego, CA). The inhibition constants of the high and low affinity state of the receptor (pKiH, pKiL) from several independent replications were averaged allowing statistical comparisons using a one-way analysis of variance (ANOVA). Group differences after ANOVAs were measured by post hoc Turkey’s multiple comparison test. The P value 0.05 and lower was considered significant. BRET2 isotherms were fitted using a nonlinear regression equation assuming a single binding site, which provided BRETmax and BRET50 values. Saturation measurements were made with increasing amounts of δ1RGFP2 and a constant amount of D2LR and D2SR fused to Renilla luciferase (Rluc). Similar saturable BRET2 curves were obtained with both D2R isoforms (Fig. 1a). The BRETmax and BRET50 values did not differ between D2LR and D2SR. Instead, a linear relationship was found between acceptor and donor constructs in negative controls which consisted of a mixture of cells singly transfected with δ1R GFP2 or D2LRRLuc (Fig. 1a). In competition experiments using increasing amounts of D2LR and D2SR cDNAs, similar displacement curves were observed as seen from a 70% disappearance of the BRET2 signal in the δ1RGFP2-D2LRRluc heteroreceptor complex using equal amounts of the two protomers (Fig. 1b). In contrast, increasing amounts of the δ1R cDNA only caused a maximal 30% disappearance of the BRET2 signal (Fig. 1b). An overall high density of PLA-positive clusters was found in the dorsal striatum (Fig. 2) based on the average number clusters per nucleus (in blue) per sample field. It was highly significantly increased vs values in negative controls and the myelinated bundles of the crus cerebri (CC) and the anterior limb of the anterior commissure (aca). In the nucleus accumbens shell, a medium density of PLA-positive D2R-δ1R heteroreceptor complexes was found and in the nucleus accumbens core a low density (Fig. 2). They were both significantly different from the number of PLA-positive clusters in cc, aca, and negative controls regarded as background values. In competition experiments, the effects of quinpirole and cocaine were examined in δ1R and D2LR cotransfected HEK293 cells and in singly D2LR transfected cells. Quinpirole produced similar competition curves in the absence or presence of δ1R (Fig. 3a). The log values for the high affinity and low affinity D2 agonist binding sites (KiH and KiL) are found below Fig. 3a. In saturation experiments, the effects of cocaine (1 nM, 10 nM, and 100 nM) were studied in cotransfected cells expressing both D2LR and δ1R and in singly transfected cells only expressing D2LR. Cocaine 1 nM produced a significant increase in the Bmax values of the 3H-Raclopride binding sites in the cotransfected cells but not in the D2LR singly transfected cells (Fig. 3b, c). Similar effects were also observed with cocaine 10 nM and 100 nM (data not shown). The Sigma-1R antagonist PD144418 (50 nM) blocked the action of cocaine in the cotransfected cells on the Bmax values. The KD values were not significantly altered by cocaine (1 nM) neither in the absence or presence of δ1R (Fig. 3b, c). 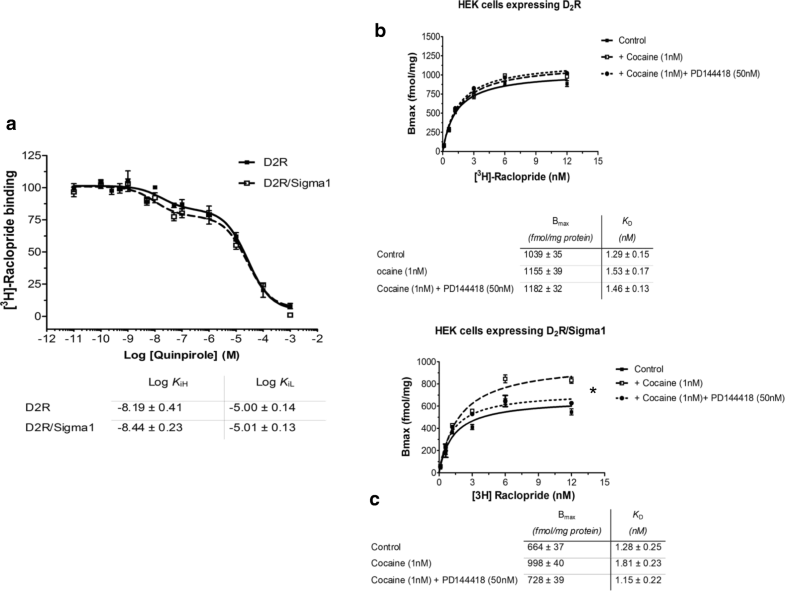 In δ1R and D2LR cotransfected HEK cells quinpirole had a reduced potency to inhibit the CREB signal versus D2LR singly transfected cells as seen from the right shift of the competition curve (Fig. 4a). However, the presence of cocaine (100 nM and 1 μM) enhanced the potency of the D2R-like agonist to inhibit the CREB signal in the cotransfected cells (Fig. 4d). Furthermore, in the cotransfected cells, cocaine alone lacked effects on the forskolin-induced increase in the CREB signal and were significantly different from the quinpirole-treated groups with or without combined treatment with cocaine (Fig. 4d). 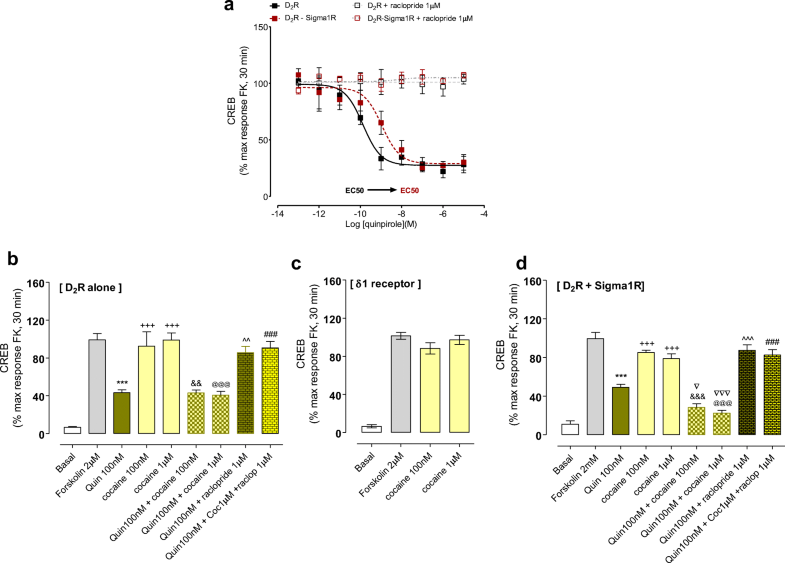 In D2LR singly transfected HEK cells cocaine at 100 nM and 10 μM exerted no modulatory effects on the inhibitory actions of quinpirole to bring down the CREB signal (Fig. 4b). Furthermore, in the D2LR singly transfected HEK cells cocaine alone at 100 nM and 1 μM again lacked effects on the increase of the CREB signal induced by forskolin 2 μM (Fig. 4b). Nor did cocaine in these concentrations modulate the inhibitory effects of quinpirole (100 nM) on the CREB signal. In δ1R singly transfected HEK cells cocaine alone at 100 nM and 1 μM again failed to influence the increase in the CREB signal induced by forskolin 2 μM (Fig. 4c). The internalization of D2LRYFP was studied in the confocal laser microscope after incubation for 30 min with different concentrations of cocaine from 1 nM to 10 μM. The internalization of D2LRYFP was measured by determining the ratio of the total area of D2LRYFP fluorescence in the cytoplasm, and the total area of fluorescence in the plasma membrane taken in % of this ratio in the basal state. The images obtained with different cocaine concentrations (1 nM to 10uM) of cocaine are illustrated in Fig. 5 in which the D2LRYFP fluorescence is found in the plasma membrane, and the cytosol at different ratios between δ1R and D2LR cotransfected and D2LR singly transfected HEK293 cells. 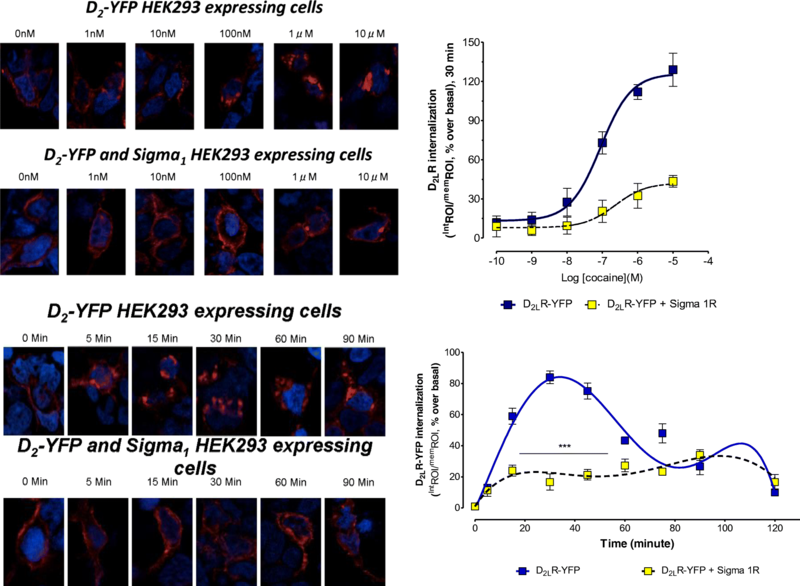 A highly significant reduction of the D2LRYFP internalization was observed in the δ1R and D2LR cotransfected versus D2LR singly transfected HEK293 cells after cocaine incubation. The inhibitory effects of cocaine started already at 10 nM and were clear-cut at 100 nM (Fig. 5). The time-course of cocaine action over 90 min was also evaluated using a cocaine concentration of 100 nM with comparisons between D2LRYFP singly expressing cells and D2LRYFP and δ1R coexpressing cells as illustrated (Fig. 5). The cocaine-induced reduction of D2LRYFP internalization in the D2LR and Sigma 1R coexpressing cells was observed during the first 60 min which was marked and highly significant. Previous work demonstrated that cocaine in the nanomolar range (10 and 100 nM) can enhance the D2-like receptor function in the brain independent of its effects on the dopamine transporter and be related to direct and/or indirect allosteric actions at the D2like receptor [1, 2]. The current results in cellular models indicate that these enhancing actions of cocaine at the D2R in the nanomolar range are dependent on the presence of D2R-δ1R heteroreceptor complexes which were previously demonstrated [14, 27, 28]. The δ1R protomer appears to mediate the enhancing actions of nanomolar concentrations of cocaine on D2R recognition and signaling found in the present article. The latter action involves also a clear-cut counteraction of cocaine-induced D2R internalization. These observations underline the existence of an indirect positive allosteric modulation of D2R via the δ1R. The reported cocaine-induced inhibition of D2R signaling over Gi/o-AC in D2R-δ1R heteroreceptor complexes found in high micromolar concentrations  could not be observed with the current low concentrations used of cocaine. The existence of D2LR-δ1R heteroreceptor complexes after cotransfection of the two receptors in cell lines could be validated using BRET2. In addition, also D2SR-δ1R heteroreceptor complexes were demonstrated after cotransfections with this technique. 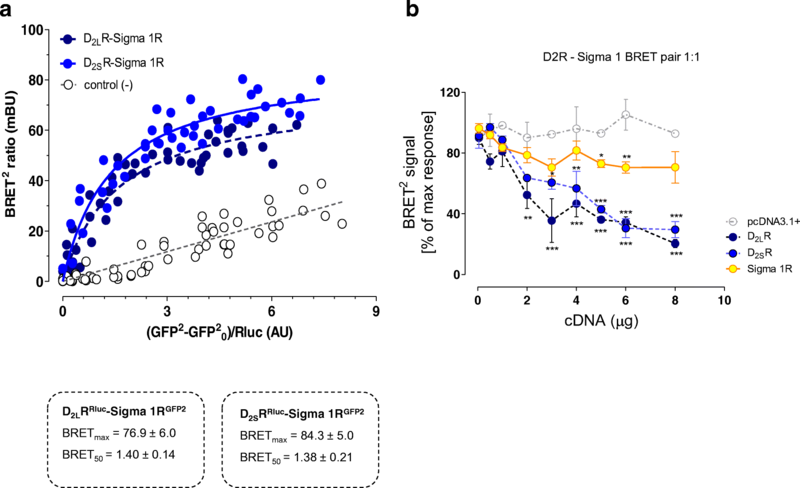 In addition, it was found in competition experiments that increasing amounts of δ1R cDNA could only reduce the BRET2 signal from the D2R-δ1R heteroreceptor complex to a minor degree. These observations can be explained by the assumption that the δ1R can interact with several domains of the D2R and not only with the D2R-δ1R interface. Thus, the δ1R may have multiple interactions with the D2R regions, increasing its impact on D2R signaling. The involvement of δ1Rs in the cocaine action is also supported by the observation that cocaine at 1 nM could significantly increase the Bmax values of the D2R antagonist binding sites only in the presence of D2R-δ1R heteroreceptor complexes. Furthermore, this action was blocked by the δ1R antagonist PD144418. It seems possible that this action of cocaine may be linked to the D2R-δ1R heteroreceptor complex and involve counteraction of cocaine-induced D2R protomer internalization (see below). An allosteric D2R-δ1R receptor–receptor interaction also appears to exist in the control of D2LR protomer signaling. In the analysis of the Gi/o-AC-PKA-CREB pathway using the CREB luciferase reporter gene assay, the presence of a D2R-δ1R heteroreceptor complex led to a reduced potency of quinpirole to inhibit the CREB signal. However, this negative allosteric receptor–receptor interaction turned into a positive interaction upon incubation with 100 nM of cocaine and restored the potency of the D2R agonist to inhibit this pathway. These findings indicate that with these nanomolar concentrations of cocaine, the Gi/o-mediated inhibition of the AC-PKA-CREB pathway is enhanced by cocaine not reduced as found with high 30 μM concentrations of cocaine . A remarkable new action of cocaine was discovered in the current experiments on D2R-δ1R heteroreceptor complexes vs D2LR mono-homoreceptor complexes regarding effects of cocaine in nanomolar concentrations on D2LR internalization. Already at 10 and 100 nM cocaine produced an increase in D2R internalization in singly D2LR transfected cells, an action which saturated around 1–10 μM. In D2R and δ1R cotransfected cells, this action of cocaine was markedly counteracted at concentrations tested from 10 nM to 10 μM at the 30 min time-interval with a time course of inhibition lasting around 60 min. These results strongly indicate that cocaine already at nanomolar concentrations can reduce D2LR protomer internalization in D2R-δ1R heteroreceptor complexes. Through the cocaine interaction with this receptor complex, allosteric receptor–receptor interactions are altered. This may lead to reduced D2LR coupling to beta-arrestin which can contribute to the markedly reduced internalization and prolongation of the D2R protomer signaling in the D2R-δ1R heteroreceptor complex at the plasma membrane. Taken together, the current results in cellular models give evidence that the cocaine action at D2Rs in nanomolar concentrations is substantially altered by the D2R presence in D2R-δ1R heteroreceptor complexes. The molecular mechanisms still remain to be clarified, but cocaine actions by binding to this heteroreceptor complex may alter its allosteric receptor–receptor interactions. This may lead to the demonstrated increase in Bmax values of the D2LR protomer and increased D2LR signaling over Gi/o inhibiting the AC-PKA system which reduced CREB phosphorylation. It was associated with a markedly reduced D2LR protomer internalization prolonging the duration of D2R activation. Such acute cocaine actions in the nanomolar range at the D2R-δ1R heteroreceptor complexes will likely contribute to understanding the role of δ1R in acute effects of cocaine on reward and seeking. The work was supported by the Swedish Medical Research Council (62X-00715-50-3) to KF, by ParkinsonFonden 2017 to KF and by Hjärnfonden (FO2017) and Karolinska Institutet Forskningsstiftelser (2016-2017) to D.O.B-E. D.O.B-E belongs to the “Academia de Biólogos Cubanos” group. We confirm and declare that all the authors meet the criteria for authorship according to the ICMJE, including approval of the final manuscript, and they take public responsibility for the work and have full confidence in the accuracy and integrity of the work of other group authors. They have substantially contributed to the conception or design of the work. Also, they have participated in the acquisition, analysis, and interpretation of data for the current review version. They have also helped revising it critically for important intellectual content, and final approval of the version to be published. In addition, they have contributed in this last version of the manuscript in writing assistance, technical editing, and language editing. DOB-E, MN, WRF, LP, KW, MF, SB, LF, ST, and KF designed methods and experiments, carried out the laboratory experiments, analyzed the data, and interpreted the results. DOB-E, WRF, KW, MF, and KF co-designed and co-worked on the radioligand binding experiments. DOB-E, MN, WRF, LP, SB, LF, ST, and KF co-designed and co-worked on the immunolabeling experiments. DOB-E, MN, LP, SB, LF, ST, and KF co-designed, discussed analyses, interpretation, and presentation of all immunohistochemistry and in situ proximity ligation assay experiments. DOB-E, WRF, LP, and KF designed and directed its implementation of the quality assurance and control of each used antibody. DOB-E, MN, and KF designed, analyzed the data, and interpreted all the BRET studies. DOB-E, MN, WRF, and KF designed, analyzed the data, and interpreted all the radioligand binding studies. DOB-E, MF, LF, ST, and KF wrote the paper. All the authors have contributed to, seen, and approved the manuscript. All studies involving animals were performed in accordance with the Stockholm North Committee on Ethics of Animal Experimentation, the Swedish National Board for Laboratory Animal and European Communities Council Directive (2010/63/EU) guidelines for accommodation and care of Laboratory Animals.